Marble is the perfect flooring surface material. This natural stone will increase the value of the property while at the same time creating a truly magnificent interior atmosphere. Marble is somewhat expensive, but buying direct from an importer/distributor can result in remarkable savings for the contractor as well as for the end-user. Many companies and individuals looking to surface an interior floor with marble find that obtaining the desired style and color is not always an easy task. Some types of marble are quarried and sold on a seasonal basis only, while other highly prized colors and patterns are so rare that a huge backlog of orders exists. Stonexchange can help with this problem. We own and operate our own manufacturing facilities, and we import some of the most sought-after colors and styles of marble at all times of the year. The Nalboor Tiles website features our entire line of natural marble stone tiles. We are a nationwide distributor of marble tile floors, and our bulk-order system means incredible savings on even a modest amount of product. When you do business with Stonexchange, you save money because you are dealing with the producer of the material as well as the distributor. Marble floor tiles can be purchased in several different ways. There are brokers who obtain large amounts of a particular style of material, have it shipped from the Mediterranean region to the United States, and sell it at profit to wholesalers and retail merchants. Marble can also be purchased directly from wholesalers who buy their seasonal marble styles from an overseas manufacturer. In both of these cases, per-piece cost is likely to be high because the material changes hands one or two times, and the material is likely split into several smaller orders. This drives up the freight costs to quite a degree. It makes far more sense to purchase natural stone materials – especially marble – from a direct import company that also owns the product from the very moment it is extracted from the quarry. Stonexchange imports large amounts of natural marble floor tiles, window sills, and transition saddles throughout the calendar year, and our pricing on full-crate or full-pallet orders is unbeatable. We also ship our marble products all across the nation from our Miami-based distribution center, meaning that our customers can expect a reliable source of natural stone whenever and wherever it is needed. Our company has studied the market trends in great detail and is fully aware of the demand for certain types of marble and other natural stone products. We offer a great variety of colors and patterns, all of which easily replace specific styles mentioned on construction plans or design templates. Regardless of whether you need ivory, cream/beige, milk, or red/brown marble for your installation project, Stonexchange can supply you with the proper color and pattern on a moment’s notice. While Stonexchange works mainly with contractors and retail merchants, our line of marble floor tiles is available to everyone. The actual price depends on the amount of product ordered, and the prices listed on the Nalboor Tiles product pages is intended as a general guide only. The larger the order, the lower the per-piece cost. Regardless of the order size, however, Stonexchange can certainly save the customer money over what is offered at the retail flooring product outlet stores. This is because we own our own materials and do not purchase them from a broker or reseller. In fact there is no reseller because our products are traded directly between us and the end-user. Our flooring tiles, window sills, and thresholds are manufactured at a specialty fabrication center located overseas. The products are carefully packed into extra-large containers designed for transatlantic shipment aboard freightliners. The material costs very little to ship because we only import full-container loads of product. Once the material arrives in the United States, it is delivered to our Florida distribution center. From there, it is sold directly to installers, construction companies, retail merchants, and the general public. The best part about our operation is the reliable supply of all materials listed on the Nalboor Tiles product pages. We operate manufacturing centers that produce the most popular marble tile colors and styles throughout the year, and we keep a full inventory at our company warehouse, constantly replacing the material that has been sold to the consumer. If the order consists of several different styles and sizes of marble tile – which is often the case for a large development project such as a condo complex – special fabrication of one or more of the styles indicated may be required. This can result in a production lead time of up to eight weeks, but customers are not charged extra for this type of order. Orders for tens of thousands of individual tile pieces can be fabricated overseas and delivered directly to the buyer’s address. Smaller home remodeling projects involving marble tile can become frustrating for the homeowner who wants to procure a certain type of material. Most retailers charge at least $10-12 per square foot on small orders of top-quality marble floor tiles. At Stonexchange, we offer the consumer a sizable price discount on even modestly sized orders. We can do this because we import our product in bulk quantities. The price will be somewhat higher than what is applied to orders for thousands of pieces, but the individual consumer will still save a substantial amount of money. 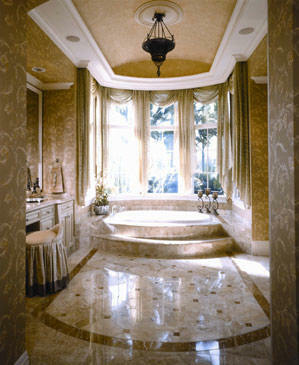 Most design projects specify a certain color tone and patterning of the marble. These styles carry industrial names such as Alabama White, Cherokee, Bursa Beige, or Calacatta. Our company has developed the perfect replacement styles for each of the popular marble types showcased by retailers or indicated in the various design magazines. Our Bianco Dolomiti is one of the most spectacular marble styles available on the market. Closely resembling the Italian or Greek white marble products commonly advertised by floor product retailers, Bianco Dolomiti is an off-white marble containing gray streak patterns. This product is available in several different sizes and is suitable for any project specifying the use of brilliant white or off-white natural stone. Vanilla Oro is another popular marble style available from Stonexchange and Nalboor Tiles. This marble is cream/white with wavy streak patterns. Especially popular as a flooring surface for the kitchen or bath, this color tone and pattern works well when complemented by darker shades of furniture, appliances, countertops, and cabinetry. Vanilla Oro can be purchased in square or rectangular sizes, and the per-piece cost depends on the amount ordered. Our popular cream Marfil flooring tiles are the perfect replacement for marble installation projects specifying Bursa Beige or Botticcino. This color and pattern style is complemented very nicely by Stonexchange’s line of Sahara Marfil thresholds and window sills. Cream and beige marble is popular because it blends quite well with other neutral tones, allowing the end-user to rearrange or replace furniture and appliances in a variety of ways and still achieve a natural blending of shades. Stonexchange also carries several darker shades of natural marble stone including milk patterns and red tones. Some of these are available in larger, 24-inch square or rectangular pieces, and the larger sizes are generally a bit thicker than the standard 3/8-inch. Interested parties can contact our company directly to inquire about specific thicknesses and the availability of large quantities of 24-inch tiles. Stonexchange does not charge a fee for custom sizes. If the standard squares do not meet the requirements of the building plans, our company can specially fabricate pieces that are larger or thicker than normal. This may involve a lead time for production, but the per-piece pricing will still be much lower than what is charged at retail outlets. Stonexchange specializes in all types of flooring products and interior design materials made from natural stone. In addition to the floor tiles highlighted on the Nalboor Tiles website, we carry a full line of marble, granite, and travertine window sills. We also manufacture top-quality floor thresholds made from the same materials. This ensures an excellent color match between tiles, sills, and floor saddles, something that many competitors in this industry cannot promise. We also supply our commercial clients with pool copings, countertop blocks, stone pavers, and travertine shower wall surfaces and soap shelves. Mixing and matching products, combining them into a single order, and delivering them directly to the customer address is never a problem when doing business with Stonexchange. We perform an extended quality control operation on all of our outgoing orders, and customers can expect a minimal amount of breakage when the product arrives at its destination. Whether you are a merchant, installer or subcontractor, or a homeowner looking for excellent value on natural marble tiles, Stonexchange and Nalboor Tiles is the only name you need to remember. Contact us today and get all the details concerning prices, delivery options, and customized orders. Stonexchange is your nationwide distributor of marble tile floors and other accessories constructed of natural stone. Start saving money today by purchasing directly from the materials source, and say goodbye to inflated retail prices.